They say ‘when life gives you lemons, make lemonade’, I say when your landlord serves notice on New Years Day, make Baileys Marshmallows! I had intended this to be a post aimed at those wishing to thank Christmas or NYE party hosts for a wonderful gathering in an alternative and ‘light to post’ manner but discovered these are so quick and easy to make (I managed it on 2 hrs sleep…. I was lying awake worrying where I will put all my board backgrounds and props come Spring) and are also great when you are feeling a bit sorry for yourself. 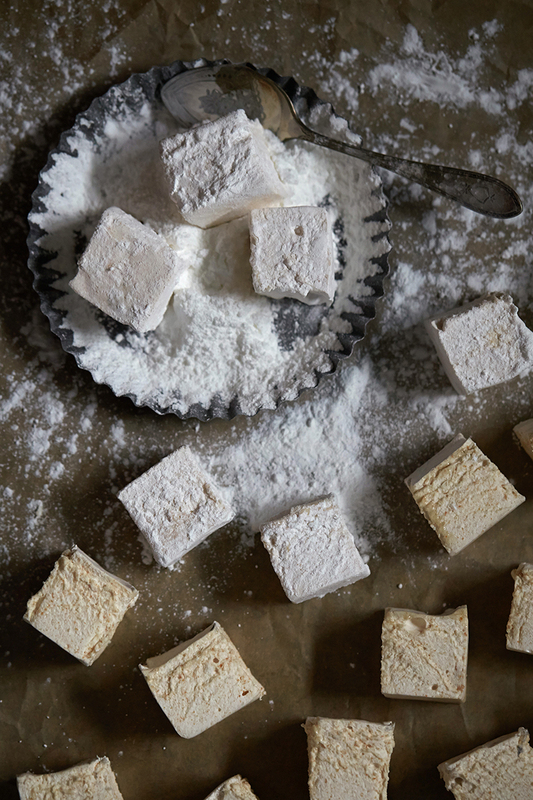 I saw this recipe for Eggnog marshmallows over the holidays and tweaked it for Baileys as thats what I had left after Christmas but you could also use bourbon, rum, kahlua, advocaat etc depending what dregs you have left! You will require a sugar or responsive digital thermometer to make these and preferably a stand mixer unless you have great arm strength for 10 mins using a hand held! In the meantime, place the sugar, Baileys, and maple syrup in a saucepan over medium heat; cook and stir until sugar dissolves. Bring mixture to a simmer and cook without stirring until candy thermometer reads 115°c, this should take around 8 to 10 minutes. Pour the syrup mixture into gelatin mixture and whisk on low until combined. Once combined, increase speed to high and beat until thick and fluffy, and mixture triples in volume, about 10 minutes. Using a lightly oiled spatula, scrape the mixture into the prepared pan. Use a lightly oiled offset palette knife to smooth out top (top surface will not be completely even). Set aside to cool at room temperature for 8 hours or overnight. Use a lightly oiled pizza wheel or serrated knife and slice into 6 rows, slicing each row into 6 to make 36 cubes. Whisk together the powdered sugar and cornstarch until well combined. Toss cut marshmallows in powdered sugar mixture. « May your salt pigs overfloweth in 2015!